Last Monday 1st of May is Labour Day, a public holiday in Singapore, Malaysia and some other countries. 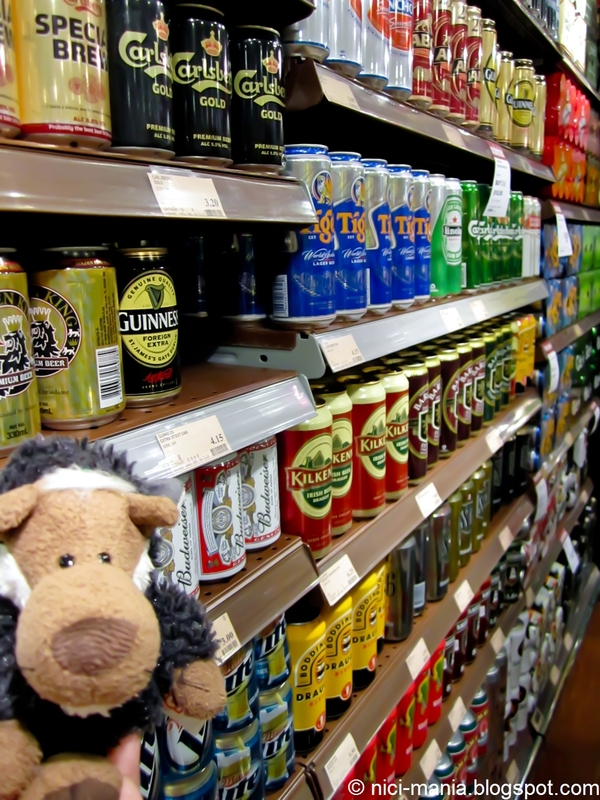 Our nici plush are having a Labour Day celebration for no particular reason, so here you see mini hugo wolf in front of Cold Storage is waiting to get some food and drinks for our celebration. 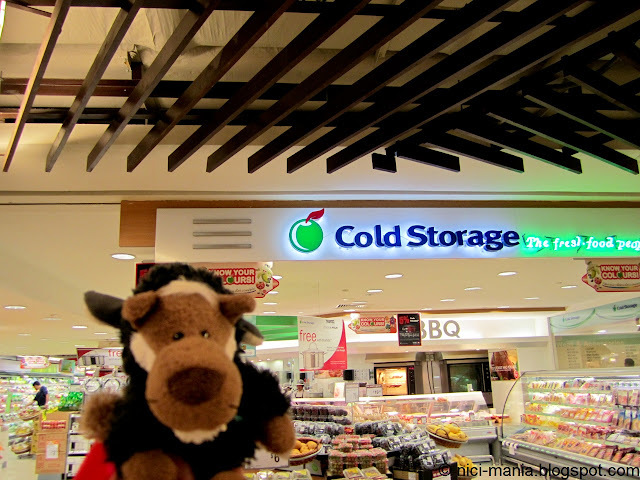 Cold Storage is all about hams, sausage, sausage and hams! 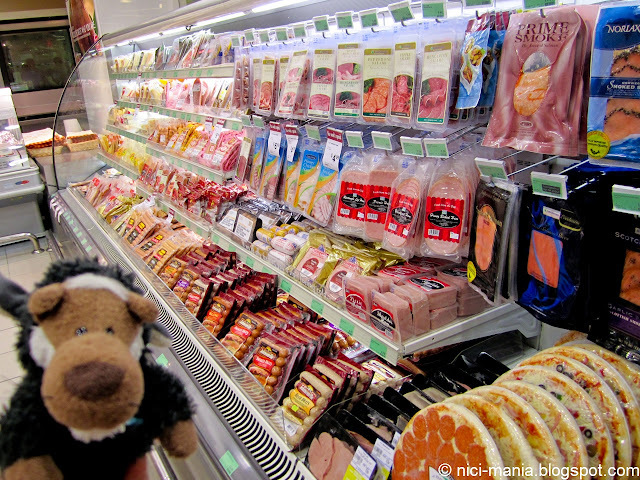 Hugo Wolf will definitely be getting our nici plush favorite cheese sausage. As usual, Cold Storage is a great place for getting shellfish like mussels and clams, hugo wolf is gonna get a nice big bag of venus clams. Hugo Wolf approaches the drinks section! Loads of beer here at Cold Storage, we need a bunch for our Labour Day holiday celebration. Other NICI plush quickly came out to join the Labour day holiday celebration. 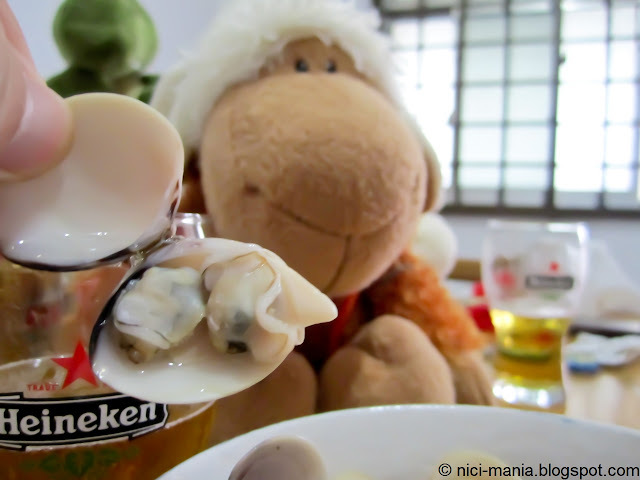 Jolly Sheebo eagerly starts the party with half a pack of clams. Twins found in a clam! 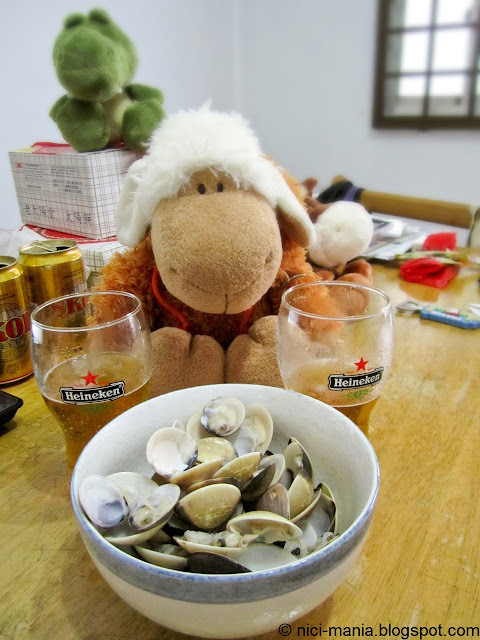 The venus clams are juicy and succulent, they are all fresh and alive when we cooked them, hence we only boiled them in salt water to cook it. 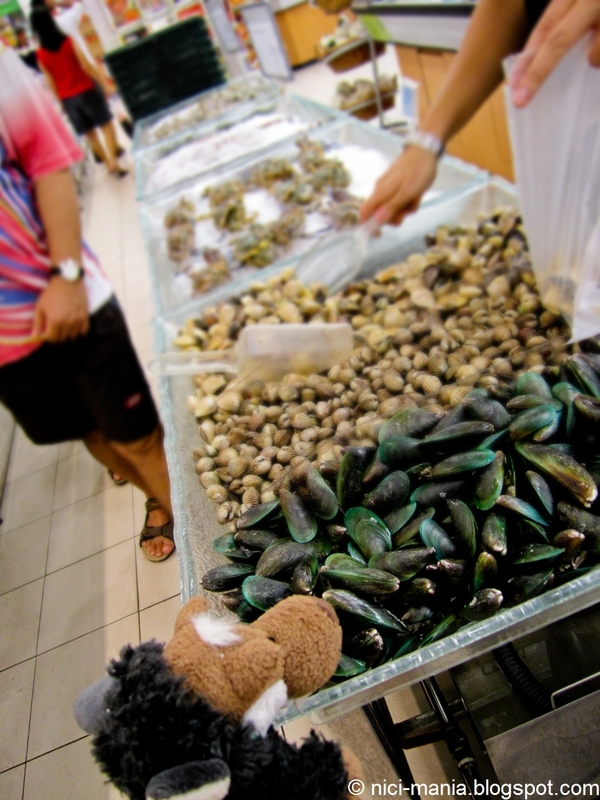 You can still taste the sea in the clams. 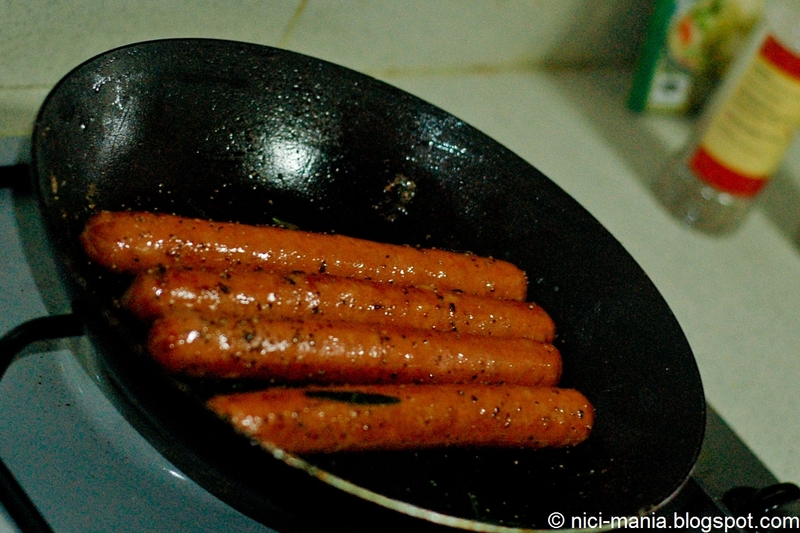 Next we are preparing some cheese sausages, pan fry in low heat with black pepper and our homegrown rosemary. 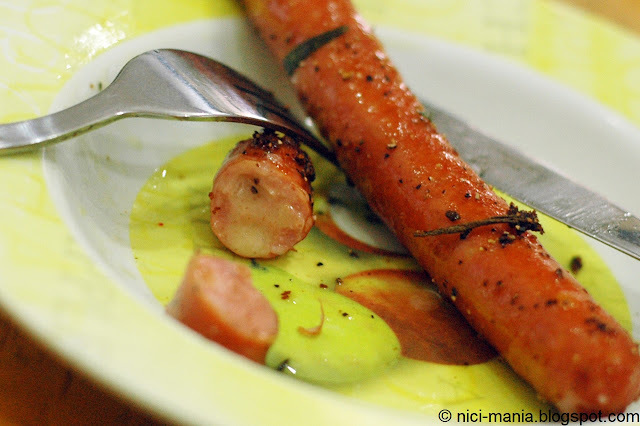 First Choice brand of cheese sausage is one of the best we have tasted. The cheese literally oozes out of the sausage non stop, you have to be careful when biting them as the cheese will explode in your mouth and you might get scaled if its too hot. 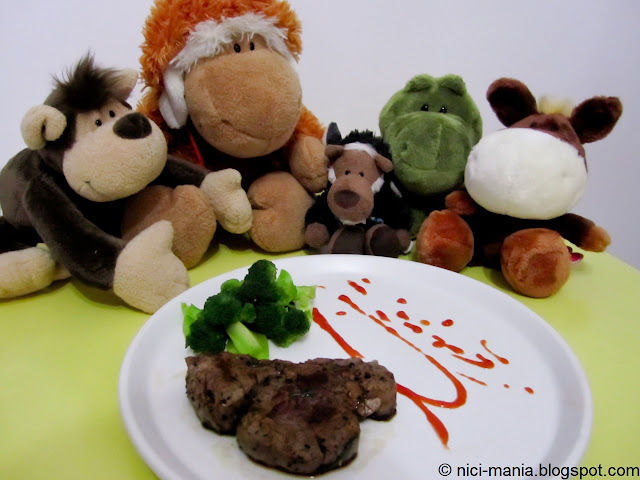 Other nici plush joins the Labour Day holiday celebration, nici monkey, jolly sheebo, hugo wolf, minily crocodile, edward horse all looking at the tantalizing piece of tenderloin beef steak in front. We were trying to do an artistic design on the plate inspired by the French culinary. But it didn't really work out well for the first try, so we eventually added the cheese sausage and fried onions to make the plate complete. 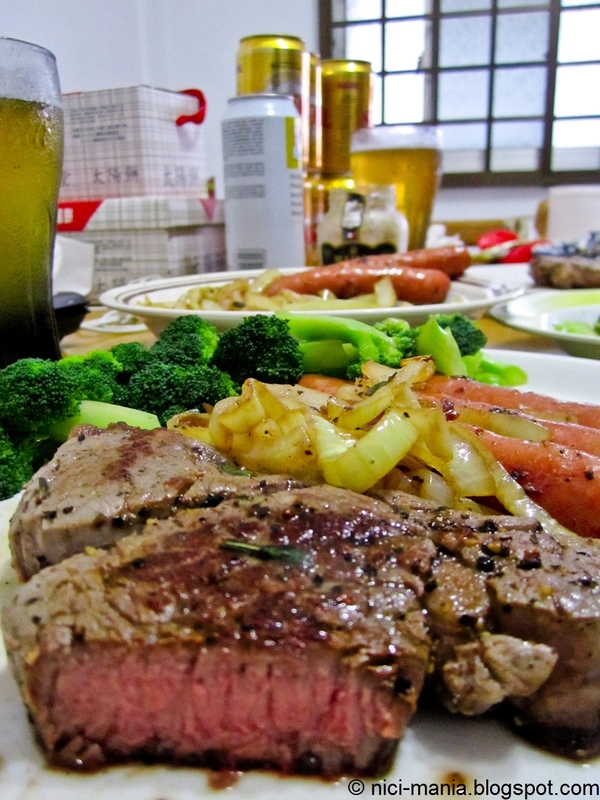 We cooked the tenderloin beef with simply salt, black pepper and rosemary. Medium rare is the always preferred way of eating steak and our culinary skills were perfect today on the thick piece of tenderloin beef. Let's show you a closer look at the tenderloin beef, the inside is still red and juicy while the outside is cooked and browned. 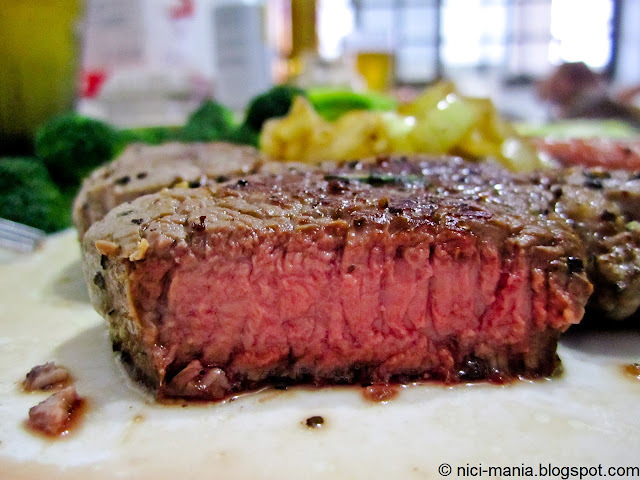 We'd say this is a near perfect medium rare steak! Not something you can usually get from restaurants outside as they tend to overcook or totally under-cook. 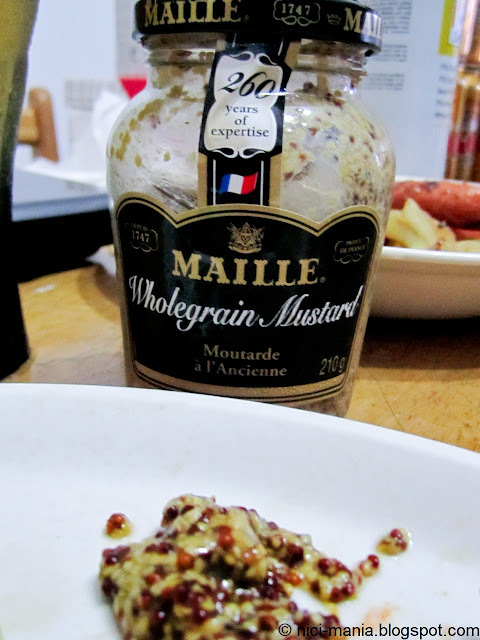 Last but not least, not forgetting our favorite wholegrain mustard which goes really well with meat and lots of meat like what we are having today. 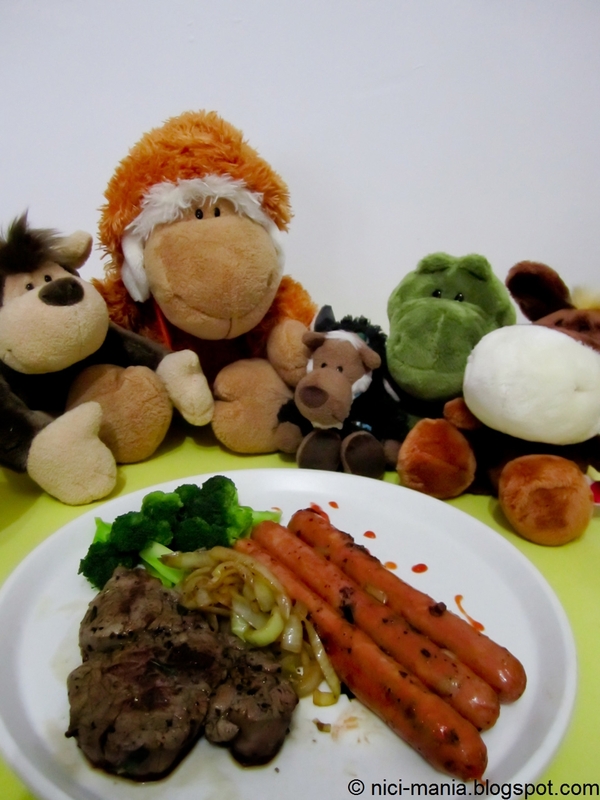 Our nici plush had a great Labour Day holiday celebration, hoped you had a nice holiday too! See ya next time. In Spain the 1st of May is holiday too. By the way, the food looks yummy!!! Bea & Raquel: I think everyone would savor a nice piece of tenderloin steak and cheese sausages!
" 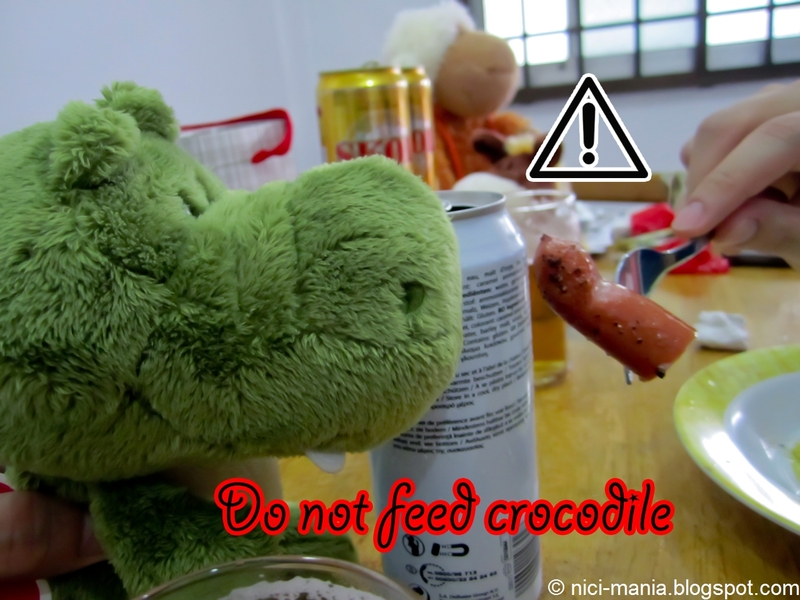 Do not feed crocodile" --- hahaha! But Croco really look like he wants a bite of the sausage. Your photos always make us beary, beary hungry!!! Btw, I just notice that your monkey looks very cute. It's rare to find such cute-face monkey now, most of them a bit twisted here and there. ;) Oo, btw do you know whether the NICI store in Msia has opened again or not? 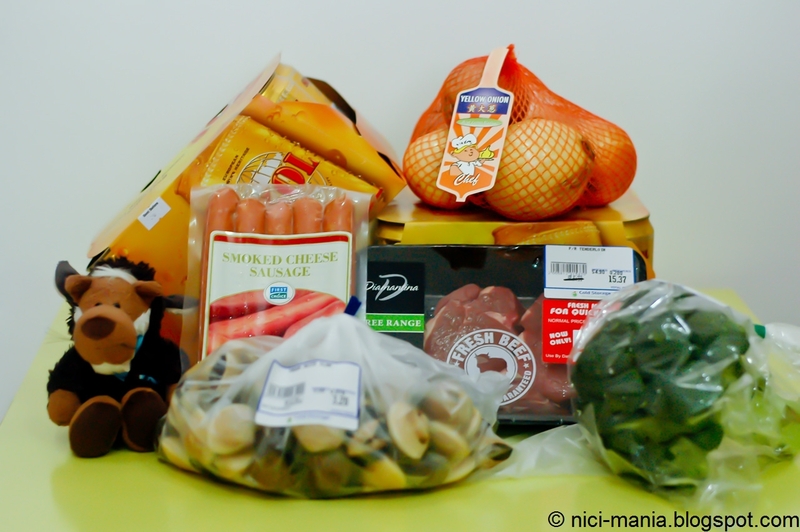 @NICI-WildfriendsYup we love cold storage for the good selection of food especially the beef. NICI monkey says thank you! ^_^ You are right, other monkeys we've seen mostly doesn't look so nice now. The 1U nici outlet is still closed last i heard from John. I will check with my cousin there and update you again.